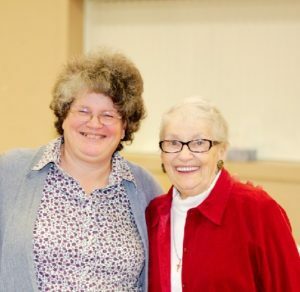 Allow me to introduce myself to any new visitors here – I am Laura (Pitzer) Emerich, and this is my blog, Mondays & Memories of My Mom, a tribute to the legacy of a woman who helped to make me who I am, as well as a mentor and “trail-blazer” for so many others. 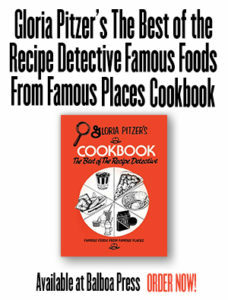 To me, she’s “Mom”; but, to the world, she’s Gloria Pitzer, the ORIGINAL Secret Recipe Detective. 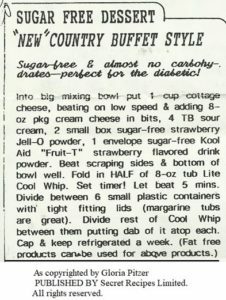 In the early ‘70s, Mom started developing (writing and testing) her own recipes that mimicked popular dishes in the restaurant, grocery and fast food industries. She passed away almost a year ago, 2 weeks after her 82nd birthday, leaving behind a beautiful legacy of faith, love, generosity, sarcastic humor and a wide range of artistic talents. 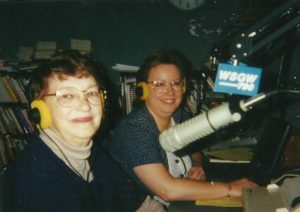 I feel so lucky to have all these memories of her and how she contributed to making me the woman I am today. So, I want to share those wonderful recollections with the world, which is so easy now through the internet and social media; and try to carry on her legacy in my own way. Mom was such a huge influence in my life. It doesn’t matter that it wasn’t all sunshine and rainbows – you have to have storms to get those rainbows and appreciate the sunshine even more! So, it’s all good! Now, it’s New Year’s Eve! 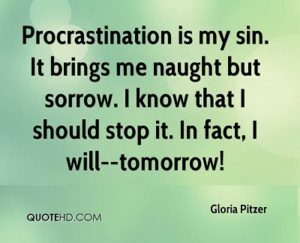 This is the time that most of us spend recalling, reasoning, recollecting, reflecting, reminiscing, remembering, ruminating and resolving to do and be better than we’ve ever been, even more than we are right now – resolutions are made that call for improvement and change in ourselves! Making a New Year’s resolution is a common tradition, whereas people resolve to change an undesired trait or behavior, to accomplish a personal goal or to, otherwise, improve their life. The New Year’s Eve anthem (a musical composition of celebration), Auld Lang Syne is an old Scots poem penned by Robert Burns in 1788; but made known more famously by Guy Lombardo’s version, which he and His Royal Canadians band sung every New Year’s Eve for about 38 years (1939-1977). The title literally translates into basic English as “old long since,” which basically equals “days gone by” or can be even more loosely interpreted as “for the sake of old times.” Any way you cut it, it’s traditionally sung on New Year’s Eve at the stroke of midnight to say goodbye to the old year and celebrate the new one. However, it is also heard at funerals, graduations, and other special occasions as a farewell or ending to that event. “Some things, perhaps, are better left unsaid and forgotten – or, like the woman in The Bible, who looked back when she was warned not to, we just might become pillars of emotional salt; hardening our feelings and losing our sense of compassion, rather than become someone with perspective, with our eyes on where we’re going, rather than where we’ve already been. In closing, as with my pervious blogs, I’d like to share with you one of Mom’s make-alike recipes that appeared on her “Free Recipes/Information” sheet, which she used to give out in exchange for a self-addressed, stamped envelope; asking only for proper credit if you care to share it. This is a photo copy of her 2000 imitation of a sugar-free, Strawberry Fluff-Style dessert like the one served at Old Country Buffet. It’s a great dessert to take to parties as a dish-to-pass, allowing yourself and others, whose New Year’s resolution is to lose weight, to indulge and not feel guilty! 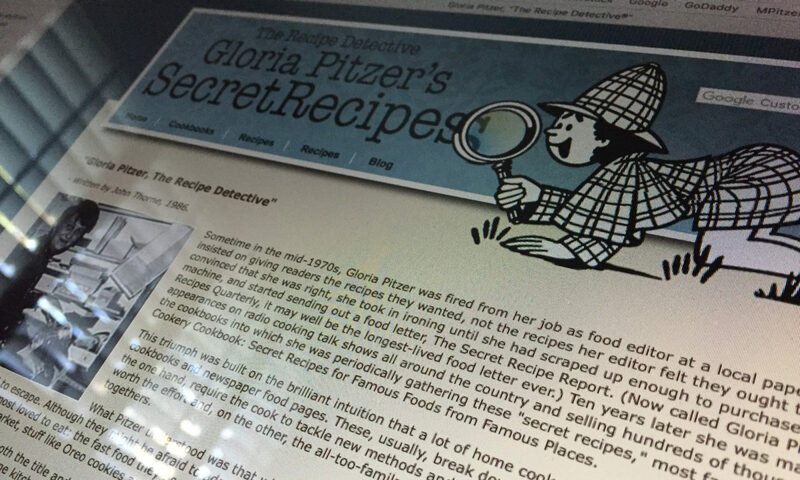 Note: this particular sugar-free recipe was not included in Mom’s last cookbook, “Gloria Pitzer’s Cookbook – The Best of the Recipe Detective”, published by Balboa Press (January 2018, 1st Printing) – a re-write by me, Laura Emerich, of her famous, self-published book, “Gloria Pitzer’s Better Cookery Cookbook” (May 1983, 3rd Printing). However, many other wonderful sugar-free recipes and humorous stories can be found in the “Dieting” Dishes chapter or section of this book on pages 283-291. Finally, dear strangers and friends, on this celebratory occasion of ringing in the new year, I wish for you all to cherish your memories – good and bad – as they are all a part of who you are and will help you in becoming who you want to be in 2019! As Mom would always say, “Happy sleuthing in the kitchen!”… But, may the table you set, pale in comparison to the example you set! Happy New Year to you all!